I don’t have this alternative ready. But, I won’t leave it at that. In this post I would like to share some observations on the patterns on information exchange my team and I saw in this web, and on its “components”. This in attempt to help improve the process of realizing understanding when conducting market system mapping exercises. We started off with an attempt to map out the value chain, both in the context of Maharashtra in India, and in several areas of rural Kenya. The webs that resulted were too complex to enlighten us in our research. In search for an alternative approach to better illuminate how the system works, we took things back to the basics. We went through the conversations we had with several of the actors within the value chains in each of the countries (particular those conversations where we interacted with farmers). We then compiled profiles of these people to help in seeking patterns on information exchange within the complex maps we sketched out earlier. business oriented farmers: a farmer who is on top of the farming community, using it to pool supply for the market, someone who acts as a node in information gathering and exchange, and also can be selling inputs to the community. bourgeois farmers (the large majority of the farming community); people who have been able to make a step forward, usually due to improvement in infrastructure, sometimes even moving there from the “stuck” situation. Despite their relative advancement they are still conservative in their aspirations. Consequent to this profiling, we looked at the interaction between these farmer types, to understand how the web of knowledge exchange and adoption between them would work. 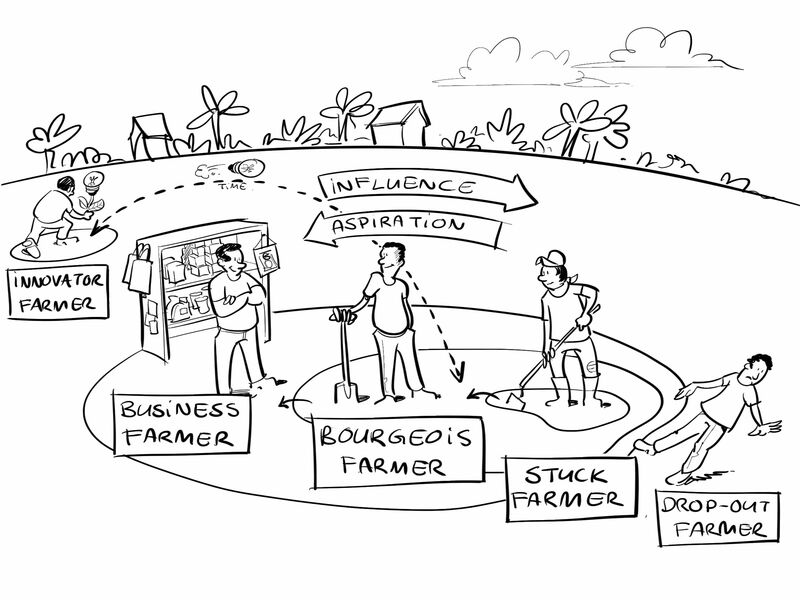 We observed that interactions between these farmer types could be differentiated and layered according to who the influencer is amongst them, who is being influenced, and what peoples’ aspirations are to achieve within the system. In other words by taking a simplification of peoples’ conceptual worldviews of influence and aspiration, a mapping emerged of an information and communication exchange ecosystem amongst farmers. We have tried to capture our perspective on this ecosystem and its different layers in the sketch below. Looking at the sketch in more detail it generally indicates that exchange doesn’t flow fully and freely within the ecosystem. There are people that subscribe to a certain part of the ecosystem, and information flows more easily and directly between them. This due to connecting worldviews that people in these groups have. There are also people who aren’t part of this section of the system (like the innovator), and information flows differently. Here, unconnecting worldviews are cause for a barrier to exchange. As a second step to understanding exchange, we attempted to identify key determinants that could show how farmers operate in their part of the ecosystem, what sources they would use for information, and what they could consequently do with that information and how they would apply it. The sketch below shows our thinking on these determinants. a static dimension of information on her holding, categorized according to timing of cash flow (and the uncertainty thereof) generated from various crops, animals, and alternative non-farming sources of income. a dynamic dimension consisting of the farmer’s dreams, and aspirations on the one hand, and networks that the farmer belongs to on the other. 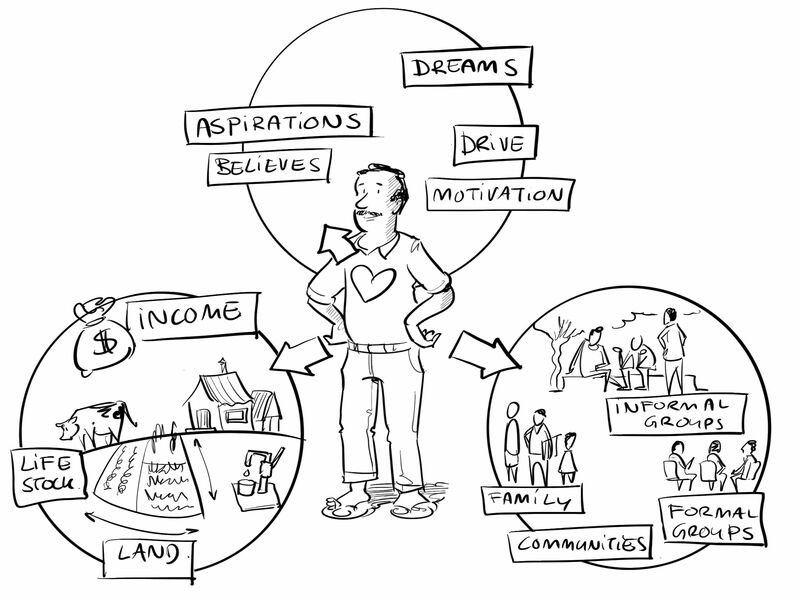 In this model changes in aspirations and networks, influence decisions made in planning out farming cash flows, and thus how the land is to be tilled and what investments will be made. By influencing aspirations and information that trickles through the network, this model would predict changes in management of the farm holding. interaction and dissemination takes place. PS. I came across a super informative video through Ken Banks’ twitter handle @kiwanja. It’s made by Dr. Clint Rogers, collating a couple of invaluable lessons on failure in ICT4D projects. Some points mentioned above resonate with the points delivered in the video. Do have a look at it, highly recommended!